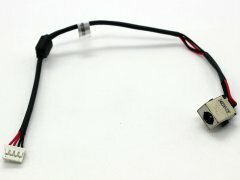 Note: Laptop manufacturers may use a different Power Charging Socket DC IN Cable for Acer Aspire E1-510 E1-510P E1-532 E1-532G E1-532P E1-572 E1-572G E1-572P V5-561 V5-561G V5-561P V5-561PG Gateway NV510P Packard Bell TE69BM Z5WT3 Series. Please enlarge the picture in this page and compare with the original item in your laptop. The customer is responsible for ordering the correct laptop parts.